Official MLB stickers at your fingertips. Are you a big baseball fan? Prove it! 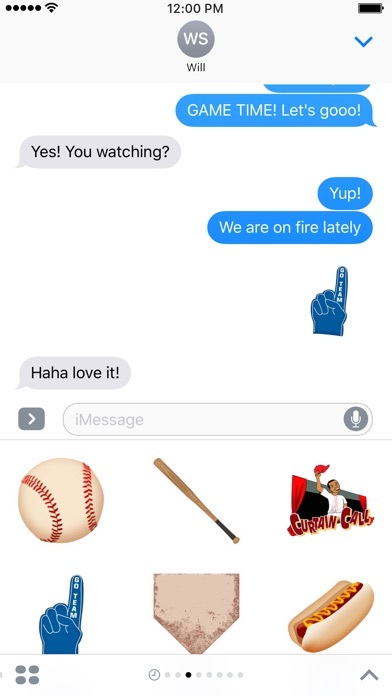 If you can’t get enough baseball, these stickers will show just how passionate you are by bringing baseball into every conversation. Stick them anywhere – on bubbles, images or even other stickers. © 2017 MLB Advanced Media, L.P. All Major League Baseball trademarks and copyrights used herein are the property of the applicable MLB entity. All rights reserved. Guys I know I could be better but should mlb work hard on a sticker pack they already work hard to do stuff so it’s good if mlb was a company based on making baseball iMessage stickers then I be upset but considering they have other thing to do it’s great.. Very basic boring icon. My emoji keyboard is has much better icons than this sticker board does. Very disappointed for such a popular past time. This is what you came out with? Why bother? Generic clip art.